A couple of Sundays ago, The Remix and I were up freakishly early (*eyeballs Pickle*) and after we satisfied Pickle's insane demand for love and attention at six in the morning put on pants, we decided to take advantage of everyone else still being asleep and go out for breakfast. But when we got onto Highway 10, on our way to Orangeville (a town about fifteen minutes south of us) we saw a pair of snow plows ahead, which meant that our driving time would double. "How dare these plows move so slowly! I'm going to write our MP about this madness!" "Ram them with the car, babe. RAM THEM GOOD!" Side Note: This is usually when The Remix turns on the radio in hopes of finding a song that will distract me. Haha! Anyway, after five minutes of life passing us by driving, we noticed that the OPEN sign was on at a little place called Barb's Country Kitchen. 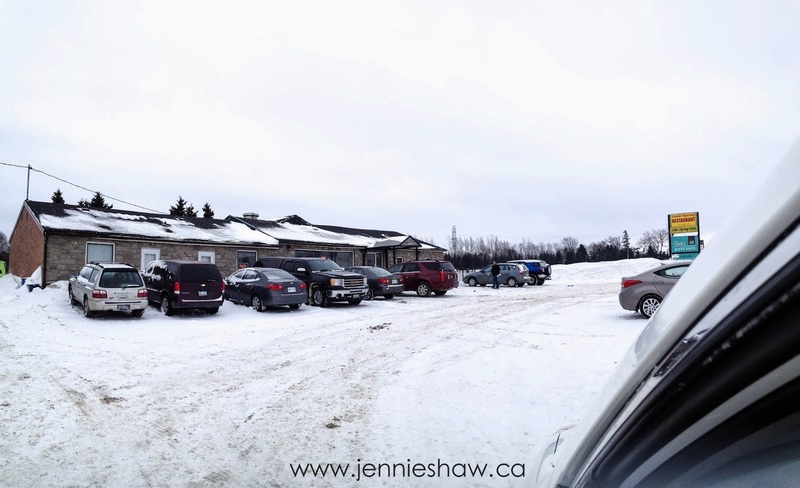 Usually, when we pass by the unassuming restaurant, the parking lot looks like this and because I can't be around too many people, we've never had a chance to check it out. But because it was so early, the parking lot was empty. YAY! So, one swift, 90-degree hairpin turn and a few steps later, we were sitting on cute red leather chairs and perusing a menu that had The Remix salivating. 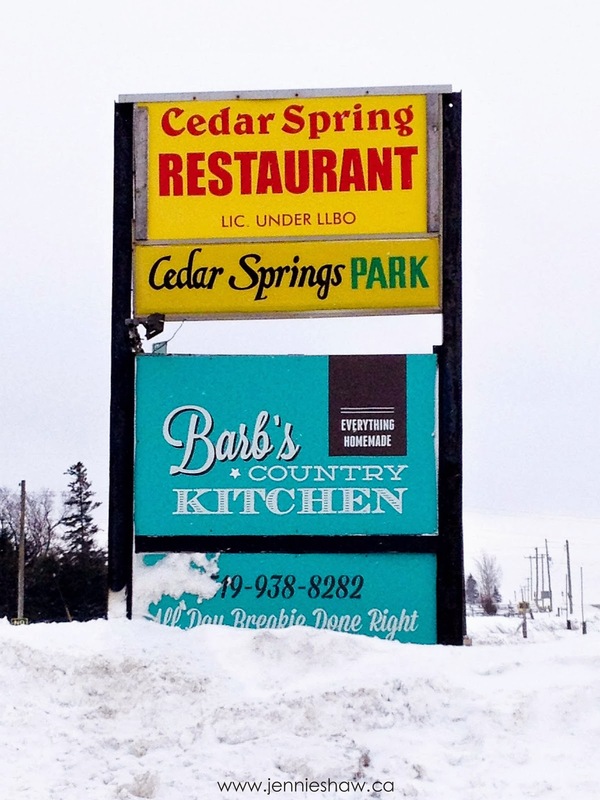 Barb's Country Kitchen's tagline is "All day breakie done right" and since breakfast is The Remix's favourite meal, he was ridiculously excited to see what they had to offer. After changing our minds about a million times because everything looked amazing, I noticed that the menu had a little box that said "Everything's Homemade." Since I had been eyeing the french toast, when Angelo, the delightful owner and New York native came over to us, I asked him if, in fact, everything was homemade. Specifically, the bread. And, lo and behold, he said that it was! It wasn't made in-house, mind you, but who the heck cares as long as it's homemade, amiright? 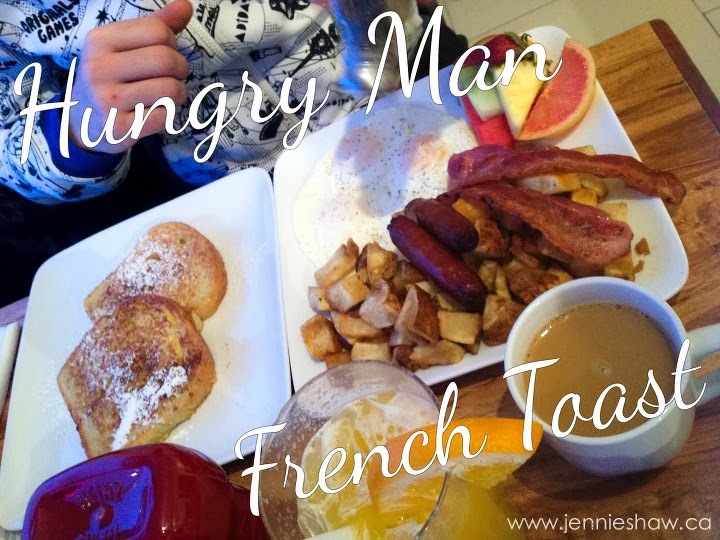 And since homemade bread is pretty much the greatest thing you can ever eat, I jumped all over the Cinnamon Raisin French Toast while The Remix opted for the Hungry Man French Toast (which came with a bunch of other stuff). Then, just for good measure, I added a side of hash browns because…well…why wouldn't I want tiny bits of deep fried potato to go with my french toast? Ha! Now, I ask you. 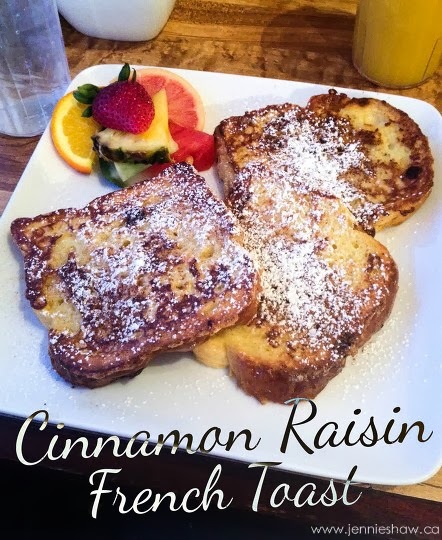 Have you ever seen french toast that looks so delicious? I wish that the internet had smell-o-vision because the scent was positively drool-worthy. Aside from two pieces of standard french toast, there's three eggs, two pieces of bacon, two sausages, and hash browns. I believe that, after our food arrived, The Remix and I spoke about eight words to each other, which mostly consisted of different versions of "Holy crap. This is amazing." I don't quite know what their secret is, but both my french toast and The Remix's was crunchy on the outside and soft and chewy on the inside. Now, when I make french toast, it's kind of crispy, but these babies had crunch, guys. It was incredible! I ate two of the three pieces I was served and felt positively stuffed. The slices are generously thick and must absorb about an egg each because usually, I can shove quite a bit more in my face. Ha! The cinnamon flavour complimented the sweetness from the syrup and there were just enough raisins to get the taste without being overly-raisiny (which is obviously a culinary term…not really. Ha!). Aside from the french toast, the hash browns were also delicious and had a bit of spice for good measure. The Remix ate just about everything on his plate, which surprised me because he isn't the biggest fan of sausage, but that's just a testament to how good it all was! Throughout our meal, Angelo came over a few times to make sure that everything was okay and there really isn't anything better than speaking with someone who's passionate about what they do. Within a few seconds, it was clear to us that Angelo is the real deal--a man who believes in what he's doing and is happy to do the work required to make his business a success. In fact, he even offers free delivery for orders over $15 and let me tell you, people, NOBODY in our area offers that, so kudos to him for setting himself apart with that service. Also, one of the french toast options was with banana bread (yes, you read that right) so double kudos to Angelo for thinking up that one. I mean, how ridiculously fantastic is that idea? Hint: the answer is VERY! The price for our breakfast was perfectly reasonable and we took home the massive amount of leftover hash browns, which made for an excellent snack later in the day. STOP DRIVING AND PULL OVER FOR THE GREATEST FRENCH TOAST BREAKFAST OF YOUR LIFE! I promise that you won't be disappointed. Oh, and you better wear your fat pants cause you're going to need the stretch. Haha! Here's all the info you'll need to find Barb's Country Kitchen! Also, just for the record, I decided to write this review after having such a great first experience. I wasn't compensated in any way. Not that I could be bought anyway, because I'm far too classy for that (ha) but I thought I'd make it clear, just the same. I love french toast but get weirded out by the whole egg on bread thing when I make it so having access to this delish made by other people french toast is really very heavenly for you. I'm feeling quite jealous as I sit here eating my yogurt and fruit. I LOVE breakfast, that one looked superb!